What do I know about writing? How do you write a comics script? In a crowd, you might be more likely to peg Kerry Callen as a middle school history teacher than as a comic book creator. He is a casual, soft-spoken guy with a folksy manner. By day, Callen works in the licensing department at Hallmark Cards, adapting the drawings of America’s most popular cartoonists into greeting cards. By night – or at least during rush hour – he creates Halo and Sprocket, one of the most charming and funny comic books you’ll find. 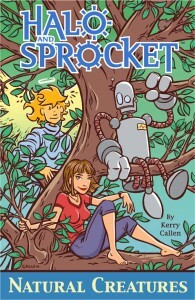 Halo and Sprocket is nominally about a young woman (Katie) who lives with an angel (Halo) and a robot (Sprocket). 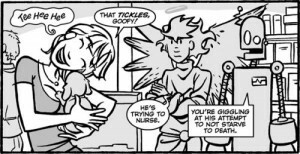 In reality, Halo and Sprocket is an outlet for Callen’s hilarious fascination with things that simply don’t make sense when you think about them for too long. No topic is too trivial to be turned into a mind bending farce: burping, why there’s no cursive version of numbers, and the fact that the proverbial glass is neither half full nor half empty no matter what Katie says. SLG published four issues of Halo and Sprocket as a comic book in 2002. 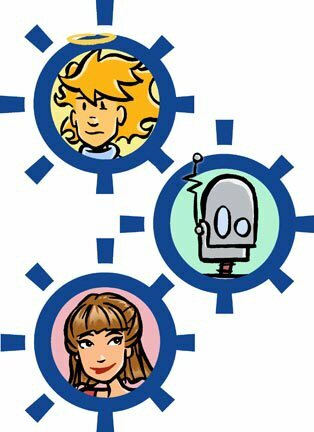 Those comics were collected as Halo and Sprocket: Welcome to Humanity (Order it from Amazon) in 2004. After too long of a wait, the next installment has arrived this year from SLG’s Amaze Ink imprint as Halo and Sprocket (Volume 2): Natural Creatures (Order it from Amazon). As part of his work at Hallmark, Callen occasionally ghosts the work of other cartoonists; sometimes the original creator has simply never drawn the pose or costume needed for a card. As a result, Callen has learned to mimic Charles Schulz’ evolving style – complete with the wobbly ink lines of Schulz’ final years. He has also formed close relationships with current and former Hallmark staff artists who moonlight in the comic book business including Chris Grine of Dark Horse’s Chickenhare and Anna-Maria Cool of Claypool’s Elvira, Mistress of the Dark. ComicsCareer.Com publisher Kirk Chritton caught up with Kerry Callen at Kansas City’s MO-KAN convention on September 20, 2008. COMICS CAREER: Which of the Halo and Sprocket stories is your favorite? KERRY CALLEN: Probably, let’s look at the name of it… it’s just a short 4-page story… You know what? Let me change my answer to “Suckers” where they’re talking about spitting saliva. 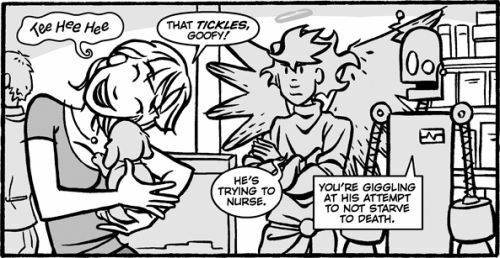 [laughter] I like it the most writing-wise, but art-wise I wish I could go back and redraw it. I think it was the second story I drew even though it was printed in a later issue. But, it has the kind of dialogue I try to get in every story. COMICS CAREER: Is that what’s most important to you then, the dialogue? KERRY CALLEN: Yeah, because all the Halo and Sprocket stuff is about the content more than the art. It’s all about the writing because I’m an artist at my day job. COMICS CAREER: How does the writing process work for you? 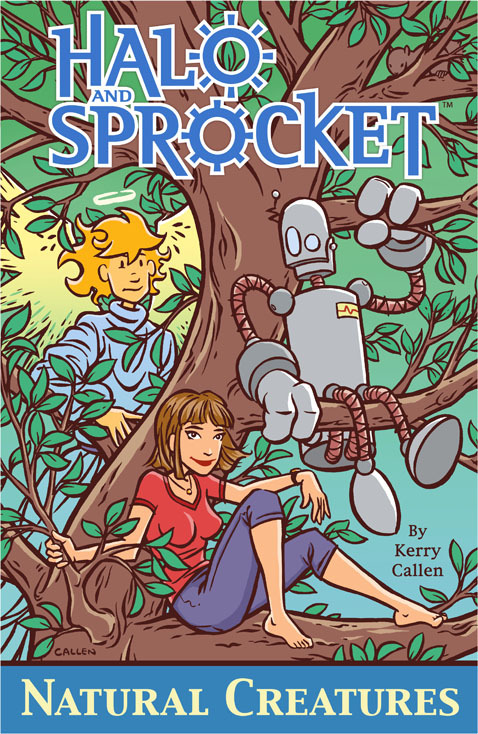 KERRY CALLEN: The writing part is easy because I have a 45 minute commute to work, so I have all that time to think about stories. They usually get pretty refined during the drive. It’s the art that I usually have to rush through. Maybe that’s why I feel better about the writing than the art. COMICS CAREER: If you have the story pretty well worked out in your mind, do you skip straight to thumbnails then? KERRY CALLEN: Since the dialogue is such an important part, I type it out and break it into sections: “that’s worth about a page; that’s worth about a page.” Then I do little thumbnails. I have it pretty much broken down before I draw it. COMICS CAREER: You mentioned your day job. Tell us more about that. KERRY CALLEN: I work in licensing at Hallmark, which has been a good thing because over the years I’ve had the chance to meet Charles Schulz, Jim Davis, and people like that. Part of what makes it great is just meeting those people and seeing that it’s basically just real people – very talented people – but still just real people doing that stuff. At some point it occured to me that maybe I’ll try doing that, too. That’s part of the reason I started doing Halo and Sprocket in the first place. COMICS CAREER: I found the same thing when I got into comics professionally. The writers and artists are just people. They aren’t demi-gods or anything. They’re good at what they do. They have talent and the dedication to stick with it, but it’s not that they’re – I don’t know – fictional or something. KERRY CALLEN: (Laughs) Yeah, that’s a good way to put it. COMICS CAREER: What are the tools you can’t work without – your essential creative tools? KERRY CALLEN: Right now I work with pencil and brush and ink. One of my favorite parts of the process is inking with the brush. I’d like to train myself though to work on a Cintiq tablet or something where I work directly on the computer because it will cut my time in half. I enjoy the pencil and brush, but I don’t want to say they’re the tools I can’t work without since I would like to work without them. COMICS CAREER: What reference sources do you use frequently? KERRY CALLEN: Well, most of this stuff is just based on my thinking time, driving to and from work. Occasionally, like in this latest volume, they go into a pet store and deal with a skink, which is a kind of lizard. So I had to look up lizards to find out what type I wanted to use. Then I had to do some research on skinks to find their bone structure and latin name. COMICS CAREER: So is Google where you go for something like that? KERRY CALLEN: Absolutely. Oh, the internet is like magic. When I started I had to go to the library for research. If I had to draw a bunch of cats, like I did on “Big Cat Puns”, I would have to go to the library and check out a big stack of books just to get a few images. But now with the internet I spend five or ten minutes and find all the reference I need. COMICS CAREER: What is it about the comics medium that appeals to you as a creator? KERRY CALLEN: I think just the fact that you get to use words and pictures together. That’s a pretty powerful combination. I guess the only thing more powerful would be film where you’ve got moving pictures and sound. But as far as what a single person can create, I think comics is more powerful than just pictures or just words. COMICS CAREER: Who has had the biggest influence on your career and how have they had that influence? KERRY CALLEN: Well, it kind of goes back to what I was saying before about being influenced by seeing that real people do this kind of thing. My first story I just drew for the fun of it just to see if I liked it, and I did. That’s actually the first story in the first collection. So I drew a couple of more and sent them out to some publishers. That was just a shot in the dark to a few different places. When I sent it to SLG, Dan Vado actually called me and asked if I would do a series. I told him I didn’t have time to do a series and he said, “Well, you can get a couple of issues done before we publish it.” I said I still didn’t know how much time it would take me and he just said, “We’re very patient.” Just him saying that to me helped a lot. It actually gave me permission to go ahead and do a series. COMICS CAREER: Obviously you’re involved in artwork during your day job as well. What are the things you do to continue to stretch and learn as a creator? KERRY CALLEN: The great thing about working at Hallmark is that I’m around a lot of talented people. Just going there every day is a good experience for me. And everybody dabbles in different types of things, not just comics. COMICS CAREER: Who are your closest confidants in the comics industry? COMICS CAREER: What’s the biggest reward of creating comics? COMICS CAREER: Yeah, that’s pretty nice. Money and compliments. COMICS CAREER: You said that the first time that you sat down to give comics a try, out came Halo and Sprocket. Was it fully-formed from the beginning? KERRY CALLEN: That’s the short version. The long version is that I knew that I liked comics and wanted to do something in comics. Well, aside from the few dabblings I’d done in the past. I wanted to do something where I could just throw out quirky ideas, and I was trying to decide how to do that. I considered an anthology book with different random stories, but working at Hallmark – and particularly working in licensing – I understand the power behind characters. If you read a Peanuts strip and it’s not funny that day it’s okay because you still like seeing Snoopy again. So, I think if you can create characters people like, it carries you through your weaker material. So, I knew I needed characters. Then I started thinking, “What character could have quirky views of the world?” I just kept thinking of individual characters. Maybe a robot? But you’ve seen that a thousand times. Or an alien? But you’ve seen that a thousand times, too. Finally it occured to me that I could have two different characters with quirky points-of-view. 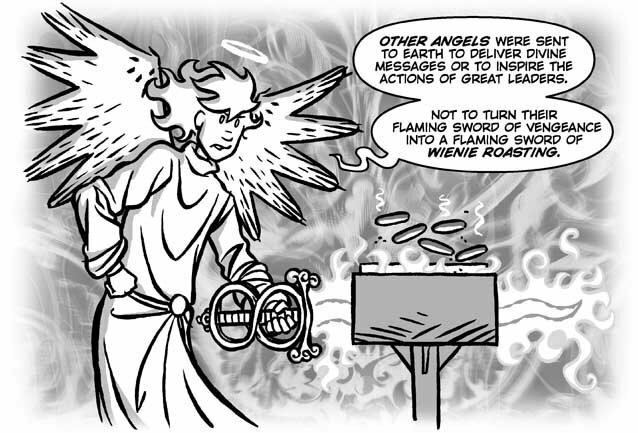 An angel and a robot gives me two opposite points-of-view on things: purely logical and purely metaphysical. Then, of course, I had to add a human just to have a real life point-of-view. Once that occured to me that’s when I went, well I’ll just draw one of these up now. But I actually thought about it a while before I drew my first story. COMICS CAREER: To me, the dynamic between these characters, logical and metaphysical, is really sharp. There seems to be magic in there. What are your thoughts about how that dynamic works. KERRY CALLEN: Someone asked me the other day which character was me. I said, well, they’re all me. That’s the way people write. The only reason that Katie’s a girl is just because I’d rather draw a girl over and over than a guy. So – thank you by the way – but I don’t see any magic in it. To me it’s just getting thoughts that I’ve had on paper. To me everything’s obvious. I think that’s what creators do. They put what’s obvious to them on paper. Not that there’s not a lot of work involved in that sometimes. There’s more in the ComicsCareer.Com forum including a full Halo and Sprocket story and links to more previews.